Panamanian gold frogs are unique – living in a very noisy environment, next to rushing water, they have evolved a way to communicate to signal to rivals and to mates by semaphore. 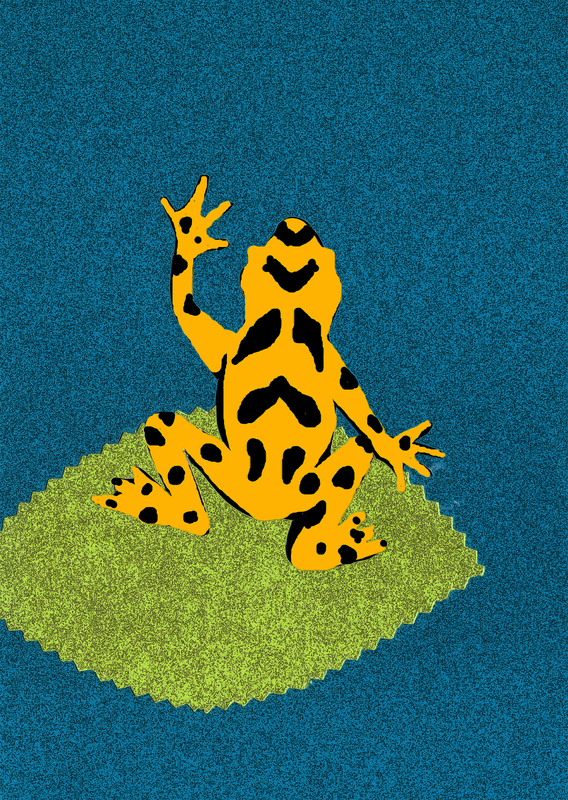 The male frog is about 40 mm, and bright gold with black spots – the female is larger, about 55 mm and completely gold. They are actually classed as toads despite being smooth skinned and looking like frogs – in fact they bear a superficial resemblance to poison dart frogs. They excrete a water soluble neurotoxin to deter predators. In 2007 these frogs’ habitat and habits were filmed for ‘Life in Cold Blood’ with David Attenborough. This turned out to be the last time they will ever be filmed in the wild, as soon after this they were attacked by the chytridiomycosis fungus, a fungus that is spreading across the world and wiping out many species of amphibian. After it struck, the remaining frogs were searched for, collected and taken into captivity. So now it is virtually sure they are extinct in the wild. These frogs have been classified as Critically Endangered by the IUCN Red List for Threatened Species. Videos and information about these toads at the BBC: BBC website. If you’d like to read more about these frogs, click here: Wikipedia. If you’d like to read about the IUCN Red List for Threatened Species, click here: IUCN Red List. Poem, illustration and all not otherwise protected © Liz Brownlee – this post is copyright material with all rights reserved, please do not re-post elsewhere – you may link to it. Love your blog and the poems! What a great way to learn about endangered animals. Thanks for stopping by my blog, and good luck with the rest of the challenge. Thanks, Katie! Good luck to you too! The things you find out are just amazing, Liz! Nice little quickie poem too. Hi Liz! Research is part of what I do – it takes a lot before I can write anything about an animal and I learn a lot on the way! I love the poem and the illustration. Thanks for teaching me something today.